This article is about the American baseball player. For other people of this name, see James Bottomley (disambiguation). James Leroy Bottomley (April 23, 1900 – December 11, 1959) was an American professional baseball player. A first baseman, Bottomley played in Major League Baseball from 1922 through 1937 for the St. Louis Cardinals, Cincinnati Reds, and St. Louis Browns. He also served as player-manager for the Browns in 1937. Playing for the Cardinals against Brooklyn at Ebbets Field on September 16, 1924, he set the all-time single game RBI record with 12. After finishing his playing career with the Browns, Bottomley joined the Chicago Cubs organization as a scout and minor league baseball manager. After suffering a heart attack, Bottomley and his wife retired to raise cattle in Missouri. Bottomley was nicknamed "Sunny Jim" because of his cheerful disposition. Bottomley was elected to the National Baseball Hall of Fame in 1974 by the Veterans Committee and to the Cardinals Hall of Fame in 2014. Bottomley also played semi-professional baseball for several local teams to make additional money, earning $5 a game ($79 in current dollar terms). A police officer who knew Branch Rickey, the general manager of the St. Louis Cardinals, saw Bottomley play, and recommended Bottomley to Rickey. Rickey dispatched scout Charley Barrett to investigate Bottomley. The Cardinals decided to invite Bottomley to a tryout in late 1919, and signed him to a $150-a-month ($2,051 in current dollar terms) contract. Bottomley began his professional career in minor league baseball in 1920. That year, Bottomley played for the Mitchell Kernels of the Class-D South Dakota League, posting a .312 batting average in 97 games, as Barrett continued to scout him. He also played six games for the Sioux City Packers of the Class-A Western League. During his time in the minor leagues, the media began to call Bottomley "Sunny Jim", due to his pleasant disposition. The next season, Bottomley played for the Houston Buffaloes of the Class-A Texas League. Bottomley suffered a leg injury early in the season which became infected, and impeded his performance during the season. Bottomley managed only a .227 batting average in 130 games and struggled with his fielding. Unable to sell Bottomley to Houston for $1,200 after the season ($15,947 in current dollar terms), Rickey sold Bottomley to the Syracuse Chiefs of the Class-AA International League for $1,000 ($13,289 in current dollar terms). Fully recovered from his leg injury in 1922, Bottomley batted .348 with 14 home runs, 15 triples, and a .567 slugging percentage for the Chiefs. After the season, the Cardinals purchased Bottomley from the Chiefs for $15,000 ($212,416 in current dollar terms). Bottomley threatened to quit baseball in a salary dispute with the Reds, as he attempted to negotiate a raise from his $8,000 salary ($146,488 in current dollar terms), a reduction from the $13,000 salary ($225,851 in current dollar terms) he earned with the Cardinals the previous year. He and the Reds eventually came to terms on a one-year contract believed to be worth between $10,000 and $13,000. Bottomley finished eighth in the NL with 83 RBIs in 1933, and ninth with 13 home runs. 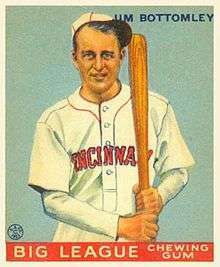 In three seasons with the Reds, Bottomley failed to hit higher than .283 or record more than 83 RBIs in a season. Bottomley left the Reds during spring training in 1935 due to a salary dispute, deciding to return to the team in April. Bottomley returned to baseball as a scout for the Cardinals in 1955. In 1957, he joined the Chicago Cubs as a scout and managed the Pulaski Cubs of the Class D Appalachian League. While managing in Pulaski, Bottomley suffered a heart attack. The Bottomleys moved to nearby Sullivan, Missouri. Bottomley died of a heart ailment in December 1959. He and his wife Betty were interred in the International Order of Odd Fellows Cemetery, Sullivan, Missouri. Bottomley was elected to the Baseball Hall of Fame posthumously in 1974 by the Veterans Committee. The Baseball Writers' Association of America charged that the Veterans Committee was not selective enough in choosing members. Charges of cronyism were levied against the Veterans Committee. When Bottomley was elected, the Veterans Committee included Frankie Frisch, a teammate of Bottomley's with the Cardinals. Frisch and Bill Terry, also a member of the Veterans Committee at the time, shepherded the selections of teammates Jesse Haines in 1970, Dave Bancroft and Chick Hafey in 1971, Ross Youngs in 1972, George Kelly in 1973, and Freddie Lindstrom in 1976. This led to the Veterans Committee having its powers reduced in subsequent years. In 2014, the Cardinals announced Bottomley among 22 former players and personnel to be inducted into the St. Louis Cardinals Hall of Fame Museum for the inaugural class of 2014. 1 2 3 4 5 6 7 8 9 10 11 12 13 14 15 16 17 18 19 20 21 Johnson, Bill. "Jim Bottomley". Society for American Baseball Research. Retrieved September 13, 2012. ↑ "End For A Blithe Spirit: Sunny Jim Bottomley Dies Suddenly; Combined Color And Top-Flight Talent". Toledo Blade. Associated Press. December 12, 1959. p. 14. Retrieved May 14, 2013. ↑ "Puzzlers In Baseball: Scout Recalls a Story of Jim Bottomley". The News and Courier. Charleston, South Carolina. March 22, 1929. p. 8. Retrieved May 14, 2013. ↑ "Talk To Students Gives Rickey Star First Sacker: Jim Bottomley, Discarded as Failure, Stages Meteoric Comeback to Fame". Ludington Daily News. Associated Press. November 21, 1923. p. 6. Retrieved May 14, 2013. ↑ "1923 National League Batting Leaders". Baseball-Reference.com. Retrieved September 13, 2012. ↑ Fimrite, Ron (September 20, 1993). "Mark Whiten". Sports Illustrated. Retrieved September 13, 2012. ↑ "1924 National League Batting Leaders". Baseball-Reference.com. Retrieved September 13, 2012. ↑ "1925 National League Batting Leaders". Baseball-Reference.com. Retrieved September 13, 2012. ↑ "1926 National League Batting Leaders". Baseball-Reference.com. Retrieved September 13, 2012. ↑ "1927 National League Batting Leaders". Baseball-Reference.com. Retrieved September 13, 2012. ↑ "1928 National League Batting Leaders". Baseball-Reference.com. Retrieved September 13, 2012. ↑ Bell, Brian (December 5, 1928). "Jim Bottomley Voted Most Valuable In National League: St. Louis Player Awarded Coveted Baseball Honors; "Sunny Jim" Leads Freddy Lindstrom of Giants by Six Points; Eight Baseball Writers Select Infielder". St. Petersburg Times. Associated Press. pp. 2–3. Retrieved May 14, 2013. ↑ "1928 World Series – New York Yankees over St. Louis Cardinals (4–0)". Baseball-Reference.com. Retrieved September 13, 2012. ↑ "1929 National League Batting Leaders". Baseball-Reference.com. Retrieved September 13, 2012. ↑ Street, Gabby (February 17, 1931). "Street, Summing Up Cards' Chances, Believes Bottomley Due For Great Year". Kentucky New Era. p. 4. Retrieved June 4, 2013. ↑ Bottomley, Jim (October 9, 1930). "Jim Bottomley Admits He Was Bust In Series: Has No Excuses To Offer for Batting Slump". Pittsburgh Post-Gazette. Universal Service. p. 18. Retrieved May 14, 2013. ↑ "1930 World Series – Philadelphia Athletics over St. Louis Cardinals (4–2)". Baseball-Reference.com. Retrieved September 13, 2012. ↑ "Jim Bottomley Regains Old Hitting Form: Veteran to Hold Down First Base For Cards Again". Pittsburgh Post-Gazette. March 23, 1931. Retrieved May 14, 2013. ↑ Davis, Ralph (March 27, 1931). "'Sunny Jim' Bottomley Will Remain With Cards As First Baseman". The Pittsburgh Press. p. 47. Retrieved May 14, 2013. ↑ "Jim Bottomley Regains Batting Eye on Eastern Trip: Cardinal Star Lands Fourth Place With .338; Davis Continues to Lead National Loop Race With Average of .350". The Milwaukee Journal. Associated Press. August 29, 1931. p. 2. Retrieved May 14, 2013. ↑ "1931 National League Batting Leaders". Baseball-Reference.com. Retrieved September 13, 2012. ↑ "1931 World Series – St. Louis Cardinals over Philadelphia Athletics (4–3)". Baseball-Reference.com. Retrieved September 13, 2012. ↑ "Carey Seeking Jim Bottomley: With Bissonette Injured, Robins Need First-Sacker". The Pittsburgh Press. United Press International. March 25, 1932. p. 39. Retrieved May 14, 2013. ↑ "Jim Bottomley Is Traded To Redlegs by St. Louis: Cincinnati Obtains Cardinal First Sacker in Swap for Owen Carroll and Estil Crabtree". The Milwaukee Sentinel. Associated Press. December 18, 1932. p. 1-B. Retrieved May 22, 2013. ↑ "Jim Bottomley Threatens To Quit". The Pittsburgh Press. United Press International. January 31, 1933. p. 28. Retrieved May 22, 2013. ↑ "Jim Bottomley Signs One-year Contract With Cincinnati: Yields After 4-Hour Talk With Weil". Rochester Evening Journal. March 3, 1933. Retrieved June 4, 2013. ↑ "1933 National League Batting Leaders". Baseball-Reference.com. Retrieved September 13, 2012. ↑ "Jim Bottomley Quits the Reds". The Milwaukee Journal. Associated Press. March 30, 1935. p. 2. Retrieved May 22, 2013. ↑ "Jim Bottomley Will Return to Redlegs". The Pittsburgh Press. United Press International. April 9, 1935. p. 31. Retrieved May 22, 2013. ↑ "To Join Browns". The Palm Beach Post. Associated Press. March 22, 1936. p. 15. Retrieved May 23, 2013. ↑ "Sunny Jim Bottomley Announces His Retirement From Baseball". The Milwaukee Journal. Associated Press. July 18, 1936. p. 6. Retrieved June 4, 2013. ↑ "Checks Out: Jim Bottomley Given Big Cheer Last Time Up". San Jose News. Associated Press. July 17, 1936. p. 6. Retrieved May 23, 2013. ↑ "Hornsby Is Given Air By Barnes: Jim Bottomley Named Acting Manager of Brownies". San Jose News. Associated Press. July 21, 1937. p. 6. Retrieved May 21, 2013. ↑ "1937 American League Awards, All-Stars, & More Leaders". Baseball-Reference.com. Retrieved September 13, 2012. ↑ "Jim Bottomley Given Release: Popular St. Louis Diamond Performer Loses Job as Browns' Pilot". St. Petersburg Times. Associated Press. November 20, 1937. p. 16. Retrieved May 21, 2013. ↑ "Gabby Street and Jim Bottomley Part Company". The Milwaukee Journal. November 28, 1937. p. 17. Retrieved May 23, 2013. ↑ "Jim Bottomley Quits Syracuse Manager Post". Schenectady Gazette. United Press International. May 20, 1938. p. 30. Retrieved May 23, 2013. ↑ "Jim Bottomley Resigns As Chiefs' Manager". Meriden Record. Associated Press. May 20, 1938. p. 4. Retrieved May 23, 2013. ↑ "Granderson joins elite homer-double-triple club, helping Tigers beat Seattle". USA Today. September 7, 2007. Retrieved September 13, 2012. ↑ "How Jim Bottomley smiled his way to the Hall of Fame". KSDK. August 17, 2009. Retrieved May 14, 2013. ↑ ""Sunny Jim" Bottomley Signs Marriage Contract". The Palm Beach Post. Associated Press. February 5, 1933. p. 2. Retrieved May 21, 2013. ↑ "Jim Bottomley Gets Job As Baseball Announcer". Meriden Record. Associated Press. April 29, 1939. p. 4. Retrieved May 21, 2013. ↑ "Bottomley Joins Chicubs As Scout". The Gadsden Times. Associated Press. January 27, 1957. p. 10. Retrieved May 21, 2013. ↑ "Jim Bottomley Dies: Heart Ailment Fatal to Former First Baseman". The Milwaukee Journal. Associated Press. December 11, 1959. p. 14. Retrieved May 14, 2013.